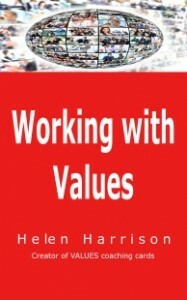 It’s written for practitioners who work with values – be they consultants, trainers, coaches, managers, directors. You can refer to it straight away by having it on your laptop or tablet. It gives clear and straightforward descriptions, as though I’m speaking with you. It answers questions about working with values, including those you may have had yourself, but haven’t had the time to consider. Or you couldn’t find answered in other books. If you like a more academic style book, this is unlikely to meet your needs! There is a bit around different types of values, which might fit that label. That’s about it academically. Example situations of actively using values – work situations, job search, finding your niche and creating a website. If you want to gain a flavour of my style of writing, click on 8 key barriers report to gain immediate access to a report about the barriers to living your values consistently – one section of the ebook.